Berwick and North Shields fought out a 1-1 draw as the teams opened their pre-season campaign at sunny Shielfield on Saturday. This was North Shields’ firs-ever visit to Shielfield and last season’s FA Vase winners had a healthy support. Berwick substitute Callum Helm gave Rangers the lead after 63 minutes when he took advantage of a mix-up in the visitors’ defence, but Shields’ substitute Gary Day equalised 12 minutes later. Berwick started with five trialists in their line-up and also named another five on the bench, including former player Dougie Brydon, who spent last year with Duns, and John Crawford and goalkeeper Mark Walters, who were previously with Coldstream in the East of Scotland League, all of whom played in the second half. Rangers only had four players from last season in their starting XI -Jonny Fairbairn, Ross Drummond, Blair Henderson and player manager Colin Cameron. One of the Berwick trialists (7) went close to breaking the deadlock when he smacked a free kick off the crossbar after 25 minutes, whilst at the other end Gary Ormiston headed over under pressure from Drummond, but at half-time it was 0-0. Berwick made six changes at the start of the second half but NS started the better and after 54 minutes Jack Walker went close for Graham Fenton’s side. Denver Morris then cut inside but his shot was parried away by the trialist Rangers’ keeper. 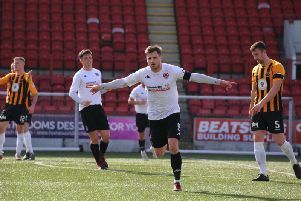 However, it was Berwick who took the lead when substitute Callum Helm took advantage of a collision between goalkeeper and defender to slide the ball into the empty net from ten yards out after 63 minutes. Another substitute, Michael McKenna had only been on the pitch for two minutes when he shot over. But North Shields levelled it after 75 minutes when substitute Gary Day cut in from the right and shot in off the inside of the far post.